Which kinds of comments may provoke emotional responses? To understand relations between emotions and online comments I need to make the research object tangible. Therefore I need some categorization. I checked the comment studies from last article according to what criteria the authors use to differentiate types of comments. I created a table offering an overview on comment studies, their research questions and variables. Unfortunately it’s quite overwhelming, which is why I additionally uploaded this PDF-version. Scroll down for a summarizing overview. 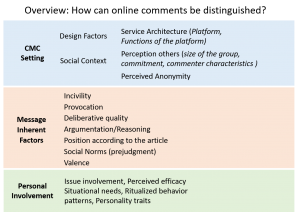 Esau, Friess, and Eilders (2017) How does platform design affect the level of deliberative quality? Ksiazek (2017) What factors influence the degree and quality of user comments on news websites? Ziegele and Quiring (2016) Why do some user comments stimulate feedback from other users while others do not? So, what am I doing with this? My research is about the question, how online comments can influence emotional reactions. Thereby, I want to focus on online comments as (social) context for interpersonal communication. That is why in the following, I guess I am going to try to expand this category. Friemel, T. N., & Dötsch, M. (2015). Online Reader Comments as Indicator for Perceived Public Opinion. In M. Emmer, C. Strippel, & Deutsche Gesellschaft für Publizistik- und Kommunikationswissenschaft e.V., Fachgruppe „Computervermittelte Kommunikation“ (Eds. ), Kommunikationspolitik für die digitale Gesellschaft (pp. 152–172). ifpuk – Institute for Media and Communication Studies at FU Berlin. Kramer, N. C., Winter, S., Neubaum, G., Roesner, L., Eimler, S., & Oliver, M. B. (Eds.) 2017. I Feel What They Say: The Effect of Social Media Comments on Viewers’ Affective Reactions Toward Elevating Online Videos. Prochazka, F., Weber, P., & Schweiger, W. (2016). Effects of civility and reasoning in user comments on perceived journalistic quality. Journalism Studies, 1–17. Sikorski, C. v. (2016). The effects of reader comments on the perception of personalized scandals: Exploring the roles of comment valence and commenters’social status. International Journal of Communication. (10), 4480–4501.